The award for “Energizing the Market with a Bundle” recognizes Eos’ seamless integration of its Arrow Series GNSS receivers with Esri mobile apps. 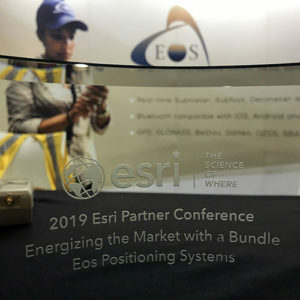 Eos Positioning Systems Inc., provider of submeter Bluetooth GPS and GNSS solutions, has received a 2019 Esri Partner Conference award in recognition of Eos’ contributions to Esri mobile applications. Esri ArcGIS users benefit from bundling the Eos Arrow GNSS receivers and Esri mobile apps to create real-time, high-accuracy field GIS solutions on consumer devices such as iPads, tablets, and smartphones. Eos’ mission is to turn the complex world of high-accuracy submeter and RTK location into simple and affordable integrations to the Esri ArcGIS platform. This is achieved with behind-the-scenes transfers of high-level GNSS information with Esri mobile apps. The exchange is nearly transparent to the end-user, and therefore minimizes the knowledge required for anyone to capture survey-grade 3D locations. 2018 saw small-system water utilities, municipalities, consultancies, co-ops and others adopt high-accuracy GIS at increasing rates. Eos believes this is due to a changing understanding of how easy and affordable high-accuracy data collection can be with the Eos/Esri bundle. The adoption of high-accuracy solutions among GIS users coincides with a general shift toward digitized asset management, away from paper maps and CAD drawings. The shift is the natural result of more affordable and easier to use technologies, the proliferation of smart devices, and industry trends including increased regulations. In 2018, Eos released two new innovative solutions for ArcGIS users. The first was the result of a three-way partnership between Eos, Esri and Laser Technology, Inc. Known as the “World’s First Laser Offset for Collector for ArcGIS,” this laser mapping solution allows field workers to collect highly accurate (submeter or centimeter) locations on their iPads and iPhones in otherwise challenging environments. This includes GNSS-impaired environments, where view of the sky is obscured or limited, and places where occupying an asset would be unsafe or expensive (such as a manhole located in a road intersection). The second solution feeds real-time orthometric heights (Z values) directly into Collector and Survey123 for ArcGIS. By supporting real-time GEOID models, Eos eliminates the need to transform ellipsoidal heights into local vertical datum manually back at the office. This reduces time-consuming post-processing as well as makes accurate elevations instantly available for use in the field. Eos is dedicated toward providing its customers with innovative solutions like this, which allow Esri users to stay within their existing ArcGIS mobile environments. For more information, contact Eos.